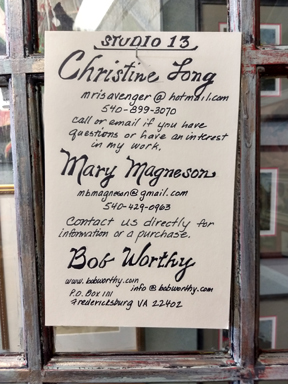 In the winter of 1986 John Nichols Jr. approached Fredericksburg area artists to seek members for an exhibition group. Originally formed as "Art Shop", the group's first venture began that summer as a co-op in the middle gallery of the Silversmith House/FCCA. By August of that year the group transitioned into its present form. No longer a co-op; the name "Exposure Unlimited" was adopted by the group. Early exhibits occurred at local community colleges and at a Fredericksburg Fine Arts Festival exhibit which was held in the DuPont Galleries during December 1986 and January 1987 at what is now the University of Mary Washington. In the spring of 1988 the group returned to the Fredericksburg Center for the Creative Arts (FCCA) with an exhibit titled "Risk Takers". Exposure Unlimited would return to FCCA for their 20th and 25th anniversary exhibits and now in June of 2016 the current membership will celebrate 30 years of exhibitions and camaraderie with their 30th anniversary exhibit. Over the years membership in the group has changed, but three of those founding members who continue with the group today are Cathy Herndon, John Nichols Jr. and Bob Worthy. Other current members include local artists Jimmy Butler, Betsy Glassie, Joan Limbrick, David Lovegrove, Retta Robbins and Paula Rose. Installing the Exhibit "30 Years of Exposure Unlimited"
First Friday Reception "30 Years of Exposure Unlimited"